I say “the same”, because even a year ago, Newt Gingrich already seemed like a man bent on the idea that we can fix the American healthcare system without creating a yet another new bureaucracy incapable of bending to the people’s will.Â A year ago he was pressing substantive health care reform ideas that acknowledged the deepest problems the Federal government has with running programs like Medicare… the government is just incapable of managing the fraud and abuse that have become one of the largest tax-payer boon doggles of all time. I say “the same”, because a year ago Newt came to Des Moines with not only an air of confidence in himself that comes from decades of experience in the public eye, but a sense of purpose in his own life beyond giving a speech to a room full of Republican activists.Â He seemed a man already on a mission, perhaps already trying to find ways to do the job of president without the title.Â Some would call him a “statesman”. But let’s say he was also a different man. On Monday, the former House Speaker seemed to have eschewed the grim demeanor he carried in 2010.Â It was almost as if making the decision to run for President had taken a weight off of his shoulders instead of putting it on.Â He answered questions from the press and from a very receptive audience of about 200 with ease.Â He handled the big question of the day, regarding his comments on Sunday  on Meet the Press, (where he confounded conservative Republicans by apparently criticizing Paul Ryan’s Medicare plan as “too big a jump” to the right), with a good explanation of his comments.Â For those of you who are interested, he essentially stated he had not communicated his thoughts well and was concerned about making dramatic changes to a program that impacts every single person in America.Â His emphasis seemed to be on caution and taking more of a phased approach to any changes in Medicare.Â Frankly, the transcript from Sunday’s program seems to say about the same thing, so I’m struggling with why people are upset about his comments. Perhaps if people took the time to read the transcript  instead of the headlines. Just sayin’. With the last in mind, I will say, “the same”, because he does and may for some time, struggle slightly with how he communicates a message that may have significant research, analysis, and a team of high-valued brain-power behind it, in a way that can be understood by folks who have not had time to walk through the thought-process with him.Â He seems sometimes to suffer from a mild form of “Keyesitis” (for those of you who recall the enigmatic and hyper intelligent former US Ambassador and former Presidential Candidate Alan Keyes), or a predilection to speaking exactly what’s on his mind, even if the listener is unable to grasp the meaning easily.Â More simply put, he can sometimes be too smart for his own good.Â I don’t think he lacks the ability to explain himself, but in an age of entertainment, technology, and the 15 second sound bite, it is substantially more difficult to get these ideas across when the attention span of your listener is so severely limited, and the assumption that everything one needs to hear can be boiled down to a dozen words. I suspect that as his campaign proceeds, he will work with his staff to formulate a message that can be more easily understood.Â His biggest risk may be answering questions for which he has not prepared a clear and simple answer, unless he can get to where he can regularly think and explain himself candidly at the level of a high school student or college undergraduate. 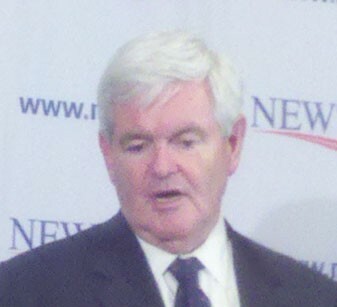 It was good to see Newt again, and I’m looking forward to seeing other candidates as the lead up the Iowa Caucus continues! 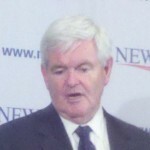 More comments on Newt’s Des Moines event can be found at Kathie Obradovich’s blog .